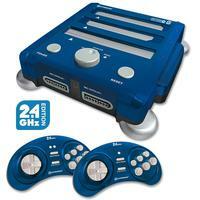 Play all of your favorite retro games with the Hyperkin RetroN 3 gaming system. Capable of playing thousands of games, the RetroN 3 accepts cartridges for the NES, SNES, and Genesis. This version's wireless controllers have been updated to 2.4 GHz for a stronger connection, lower latency, and further range.